Tupelo Middle School, located in Tupelo, Mississippi, hosts a student population of over 1,000. In the spring of 2015, TMS was offering Information and Communications Technology II instructional content, but Dr. Kristy Luse, who was principal at the time, wished to expand STEM curriculum offerings further. Though she pitched her idea to district administration and representatives from the Mississippi State Department of Education (MDE), the district felt the timing wasn’t right. By spring of 2017, Dr. Luse reformulated her idea, pitching it as a district-level employee this time.“I’ve always believed students required early exposure to various career fields, mainly in the STEM area,”she informed. With support from MDE leadership and approval from her superiors, Dr. Luse began to formulate a curriculum based around student interest and potential, stating that the process was “one more driven by a passion for students than a true algorithm or instruction. I wanted an environment which responded to the career pathways for which students should be prepared.”Thus was born what Dr. Luse refers to as the Sample Platter. “With the Sample Platter, 7th grade students go through rotational classes in entrepreneurship, finance, computer science, architecture, and engineering,” described Dr. Randi Peel, a fellow district employee. “At the end, they decide which course was most appealing, choosing a subject to study more deeply in 8th grade.” As this is the first year the STEM courses are being offered, both 7th and 8th graders are taking part in the sampling of subject areas. Dr. Peel began to search for a middle school friendly computer science offering that could be easily implemented online. It wasn’t long before she came across Edhesive. “Edhesive stood out more than any other program that I researched. From my experience, Edhesive is spot on for what we needed,” she explained. After reaching out to the school partnership team, Dr. Peel was able to demo the course, quickly incorporating it into the STEM curriculum plan. This year at TMS, there are 4 Explorations in Coding teachers, instructing a total of 89 students. “The exposure to coding curriculum is greatly valuable,” states EIC teacher Renada Hughes. “They establish a base of knowledge in programming before high school.” For both Hughes and her colleagues, teaching EIC has been a first foray into the world of programming. “We began going through each lesson ahead of our students. We can then discuss the lesson together and have a game plan ready.” Hughes shared that the very detailed lessons explain the programming concepts very well. “The course is really user friendly. The students are able to read articles and watch videos, gaining background before they start the coding activities,” she continued. “By the end of the first module, the students had established a routine. They’re being asked to do a lot of critical thinking and problem solving. Being exposed to a program they’ve never seen is teaching them to think differently. They’re learning how to accumulate knowledge, applying what they’ve learned in previous modules to complete activities in the later ones. Hughes believes that Python is a great beginning language for early programmers to learn. “The EIC course is structured to be a great stepping stone to basic programming, especially for students at a middle school level. The terminology is user friendly. It’s detailed and very well organized. The step by step presentation throughout the modules is simple for the students to follow. I remind them to read carefully and work through examples. Above all, they love it!” Hughes went on to say that the benefits of computer science and STEM curriculum are endless. 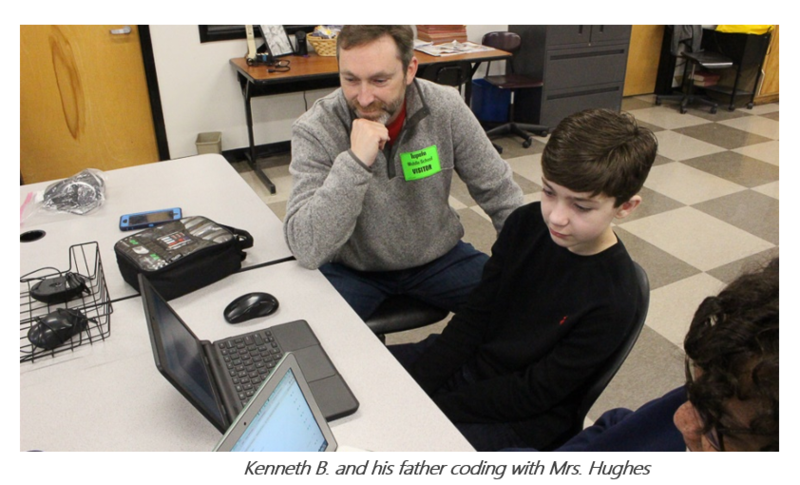 She referenced an article she had just read, which stated that “coding is one of the most important job skills of the future.” Hughes has a background in business and is an active participant of the community advisory committee. “Advisors on our committee come from a wide range of interests and professions. A recent topic of conversation has been that students are just not being exposed to careers that are needed in computer science and technology. When being exposed to STEM curriculum as early as elementary or middle school, doors are opened. They can gain so much knowledge at a young age.” Hughes especially noted that not all students continue on to college after graduation. There are multiple STEM related jobs available immediately after high school for students with working knowledge. To other schools considering Edhesive, Hughes says “go for it. 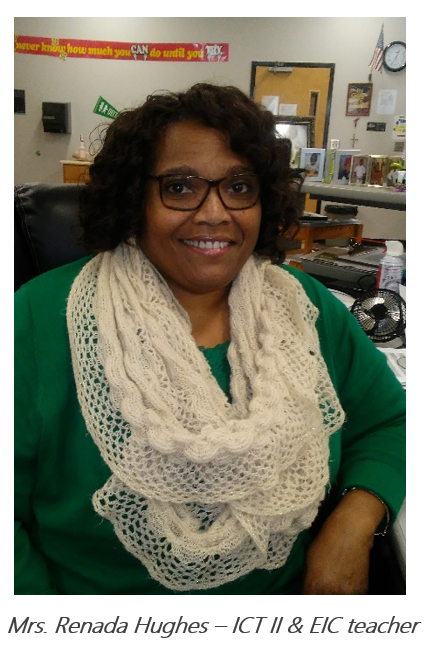 Remain positive even through challenges as you explore new content, and simply have fun while you watch your students soar academically.” Dr. Peel points out that “traditionally, there aren’t a lot of teachers with content knowledge regarding computer science and engineering. Edhesive changes your whole mindset. It makes it okay to grow as an educator, enabling your students to grow their knowledge along with you. It can be intimidating to expand into a subject beyond your own area of experience. With something as amazing as Edhesive to guide us, we are able to incorporate hands-on problem solving. It’s necessary to be able to shift our entire mindset around teaching computer science to the students of today.” Dr. Luse adds that “the exposure to collaborative and problem-solving opportunities gives students not only the skill sets necessary for real-world application, but also exposes them to numerous areas of career interest, even in the arts. It’s all based in a STEAM realm. Moreover, the retention of students in school is essential to a profitable and innovative workforce for any community.” TMS has begun the process of integrating curriculum not only for students’ current success, but their futures.